When she was launched in 1911, the S.S. Willis B. Boyer was actually called the Col. James. M. Schoonmaker, and believed to be the largest bulk freighter in the world. Over the next 3 years, the Queen of the Lakes she broke multiple record cargo records. The ship is over 600' long and 64' wide and has a bulk cargo capacity of 15,000 tons. She served on the Great Lakes until 1980. At that time the common fate of retired ships was demolition and a trip to the scrap yard for recycling. 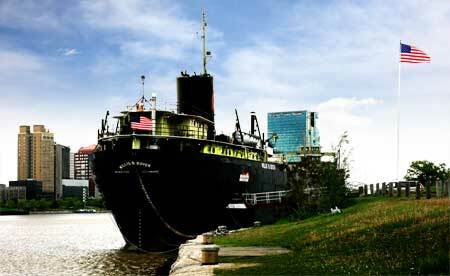 However, that final trip was avoided thanks to the efforts of the Toledo-A-Float non-profit organization that brought the retired ship to the Maumee River where she took up residence at Toledo's International Park. Over the next several years the ship was converted from hauling freight to documenting Great Lakes shipping in the form of a floating museum. International Park was at one time the main coal handling facility for the Port of Toledo. Afrter the Col. James. M. Schoonmaker was outfitted, her first commercial trip was to that coal field to pick up a load of coal headed for Sheboygan, Wisconsin. Over the years the large ship would be purchased and ownership would be transferred. In 1969, the Schoonmaker was purchased by the Interlake Steamship Company, where she was chartered to the Republic Steel Corporation and renamed the Willis B. Boyer in honor of the company's president. Thousands of visitors are welcomed on board each year. The onboard museum is open 7 days a week from the first of May to the last day of October. The Boyer is currently undergoing a major renovation to be completed by her Centennial Anniversary in 2011. She may also be moving to a new location downriver to the new Toledo-Lucas County Port Authority building on the west side of the Maumee where it is hoped that the Inland Seas Maritime Museum will soon be located. Monday - Saturday 10:00 a.m. - 5:00 p.m.